I live in Luxor since a few years and beyond Pharaonic temples that draw hundreds of thousands of tourists, I am I attracted to the beauty of the countryside in Upper Egypt. I live in Luxor since a few years and beyond Pharaonic temples that draw hundreds of thousands of tourists, I am I attracted to the beauty of the countryside in Upper Egypt. I try through this project to show everyone, all that is beautiful to see in Egypt beyond the millennial history. What is it pinhole camera? 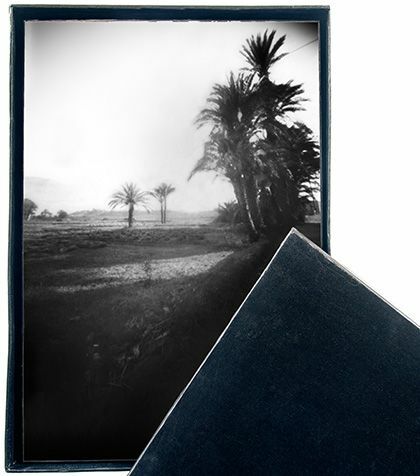 The pinhole photography is the most basic system to make picture. It's a simple sealed box to light that will be pierced with a tiny hole (0.3 mm!). This hole will serve as -objective- as to take a photograph. You have to have a system to -open- and -close- that hole. You need also have a sensitive support in the interior of the box on which the image will be formed. For my part, my pinhole camera is simple milk boxes. I use photographic paper as a sensitive surface. After the shooting, I must make a work in darkroom (photo laboratory) to get my negative. Thereafter I scan the negative and I make the final adjustments in Photoshop. I always work with the same photo studio. The print is then glued onto a wooden board chipboard which is chamfered at 45 degree and painted in black. This -frame- has on his back to a wall hanging system. So you have a ready object to be hung on wall.